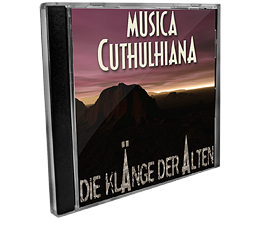 The very first tracks of Musica Cthulhiana were free mp3 downloads at www.nyarlathotep.de in 2001. The audio-tracks, songs and music were of course inspired by the Call of Cthulhu RPG and the stories and characters by H. P. Lovecraft (from Azathtoth to the Necronomicon). Later a CD with additional tracks was sold to the readers of nyalathotep.de and the german magazine Cthuloide Welten only. There weren’t sold large quantities and today the CD is a rarity. You can hear some songs on the following album “The Fourth”.